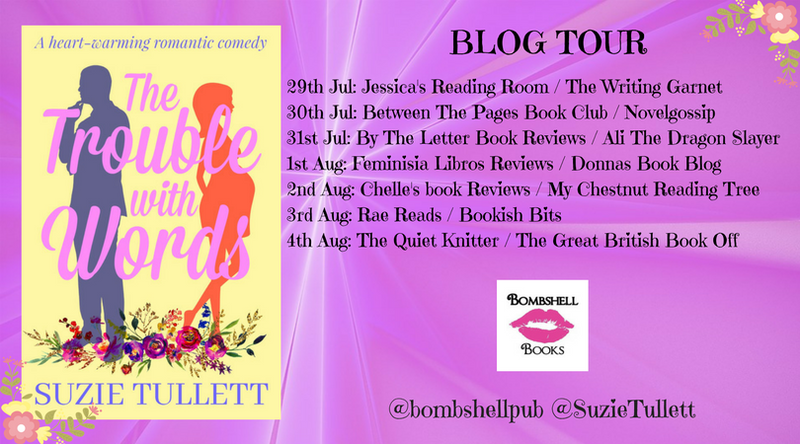 Today I am delighted to be on the blog tour for The Trouble with Words by Suzie Tullett and a huge thank you to Sarah Hardy for inviting me. Annabel is desperate to have a baby – there’s just one problem. She’s single and after losing her husband in a hit and run accident, she’s just not ready for another relationship. Dan is on the hunt for the perfect woman but when his mother drops a bombshell, he starts to feel the pressure. When Dan and Annabel’s worlds collide, both start to think that maybe they’ve found the solution to their problems. But things are about to get messy. Can Dan and Annabel get what they want? This book was a little gem of a romantic comedy that grabbed my attention as soon as I opened it to that first page. I can’t remember the last time I got weepy whilst reading this genre of book but I absolutely sobbed at least twice! I’m turning into a big softie in my old age! The characters are all beautifully crafted here, there wasn’t a single one that I didn’t like and they all played their parts perfectly in this generously layered comedy drama. From the first chapter I was hooked as Annabel talks to her dead husband and comes to realise that she now needs a baby to make her life complete. I was desperate for her to get her Happy Ever After even though I knew that her path to that goal was going to be a tricky one. And then she met Dan! I loved Dan! Still living with his mother, I was expecting a mummys boy but what I got was a hilarious but mostly incredibly poignant mother/son relationship. Dan’s mum really made this book for me and I was often snorting out loud at some of the things she came out with! And as Annabel and Dan’s relationship progressed, there were a few stings in the tail that seemed determined to prevent them from following their hearts. This isn’t a sickly sweet romance as there is an edge cutting through the comedy leading to a bittersweet twist that surprised me but also felt right. Suzie Tullett has a way with words that will have you laughing one minute and crying the next. She engages her readers, taking them on an emotional journey with a cast of characters who felt like friends by the end. And she has also left me wanting to know what Annabel and Dan are up to now as they became part of my life whilst reading The Trouble With Words and I miss them! Definitely a recommended read for lovers of romantic comedy. The Trouble With Words: a heart-warming romantic comedy is available to purchase now.